Reading and share top 10 famous quotes and sayings about Materials Things by famous authors and people. Browse top 10 famous quotes and sayings about Materials Things by most favorite authors. 1. "An acre of poppies and a forest of spruce boggle no one's mind. Even ten square miles of wheat gladdens the hearts of most . . . No, in the plant world, and especially among the flowering plants, fecundity is not an assault on human values. Plants are not our competitors; they are our prey and our nesting materials. We are no more distressed at their proliferation than an owl is at a population explosion among field mice . . . but in the animal world things are different, and human feelings are different . . . Fecundity is anathema only in the animal. "Acres and acres of rats" has a suitably chilling ring to it that is decidedly lacking if I say, instead, "acres and acres of tulips"." 2. "Writing, music, sculpting, painting, and prayer! These are the three things that are most closely related! Writers, musicians, sculptors, painters, and the faithful are the ones who make things out of nothing. Everybody else, they make things out of something, they have materials! But a written work can be done with nothing, it can begin in the soul! A musical piece begins with a harmony in the soul, a sculpture begins with a formless, useless piece of rock chiseled and formed and molded into the thing that was first conceived in the sculptor's heart! A painting can be carried inside the mind for a lifetime, before ever being put onto paper or canvass! And a prayer! A prayer is a thought, a remembrance, a whisper, a communion, that is from the soul going to what cannot be seen, yet it can move mountains! And so I believe that these five things are interrelated, these five kinds of people are kin." 3. "Oh! how immaterial are all materials! What things real are there, but imponderable thoughts? Here now 's the very dreaded symbol of grim death, by a mere hap, made the expressive sign of the help and hope of most endangered life. A life-buoy of a coffin! Does it go further? Can it be that in some spiritual sense the coffin is, after all, but an immortality-preserver! I 'll think of that." 4. 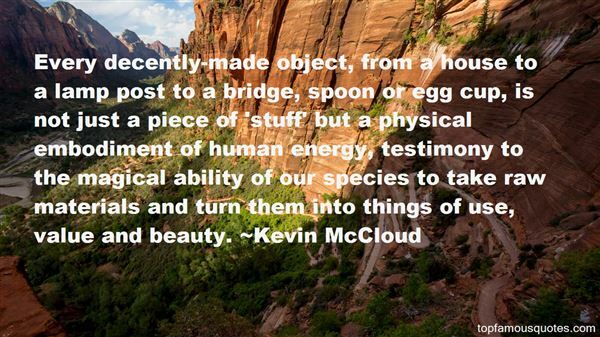 "Every decently-made object, from a house to a lamp post to a bridge, spoon or egg cup, is not just a piece of 'stuff' but a physical embodiment of human energy, testimony to the magical ability of our species to take raw materials and turn them into things of use, value and beauty." 5. "I would revisit them all in the long course of my waking dream: rooms in winter, where on going to bed I would at once bury my head in a nest, built up out of the most diverse materials, the corner of my pillow, the top of my blankets, a piece of a shawl, the edge of my bed, and a copy of an evening paper, all of which things I would contrive, with the infinite patience of birds building their nests, to cement into one whole; rooms where, in a keen frost, I would feel the satisfaction of being shut in from the outer world (like the sea-swallow which builds at the end of a dark tunnel and is kept warm by the surrounding earth), and where, the fire keeping in all night, I would sleep wrapped up." 6. "CHOW^TM contained spun, plaited, and woven protein molecules, capped and coded, carefully designed to be ignored by even the most ravenous digestive tract enzymes; no-cal sweeteners; mineral oils replacing vegetable oils; fibrous materials, colorings, and flavorings. The end result was a foodstuff almost indistinguishable from any other except for two things. Firstly, the price, which was slightly higher, and secondly, the nutritional content, which was roughly equivalent to that of a Sony Walkman." 7. "Parents should also question much of the contemporary emphasis on special materials and equipment for learning in a child's environment. A clutter of toys can be more confusing than satisfying to a child. On the other hand, natural situations, with opportunieties to explore, seldom overstimulate or trouble a small child. Furthermore, most children will find greater satisfaction and demonsstrate greater learning from things they make and do with their parents or other people than from elaborate toys or learning materials. And there is no substitute for solitude - in the sandpile, mud puddle, or play area - for a yound child to work out his own fantasies. Yet this privilege is often denied in our anxiety to institutionalize children." 8. "Every dish in the ferial cuisine, however, provides a double or treble delight: Not only is the body nourished and the palate pleased, the mind is intrigued by the triumph of ingenuity over scarcity - by the making of slight materials into a considerable matter. A man can do worse than to be poor. He can miss altogether the sight of the greatness of small things." 9. "There's this very vulnerable planet of ours with finite resources. 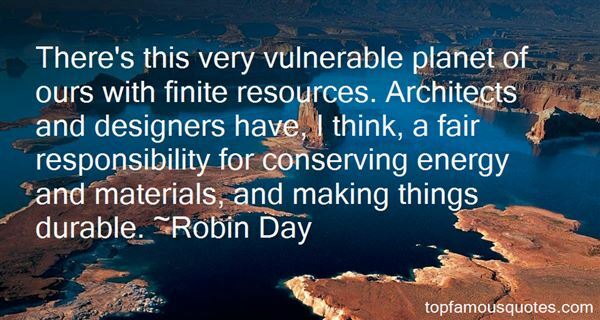 Architects and designers have, I think, a fair responsibility for conserving energy and materials, and making things durable." 10. 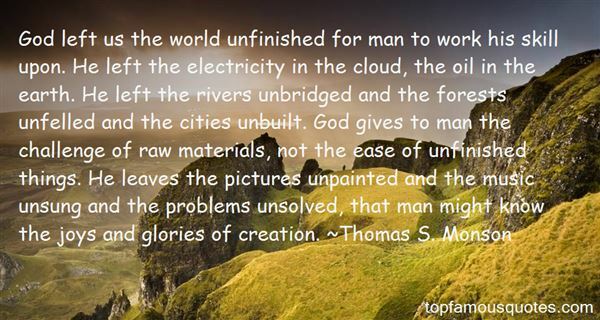 "God left us the world unfinished for man to work his skill upon. He left the electricity in the cloud, the oil in the earth. He left the rivers unbridged and the forests unfelled and the cities unbuilt. God gives to man the challenge of raw materials, not the ease of unfinished things. He leaves the pictures unpainted and the music unsung and the problems unsolved, that man might know the joys and glories of creation."